Some brands are known for functionality over aesthetics, offering a helping hand that rarely gets the attention it often deserves. Scholl definitely fit within that camp, providing a huge portfolio of foot care products that I couldn’t live without; not only do I love their foot soak, overnight foot serum and clippers, but the original Velvet Smooth foot file is one of those products I recommend to anyone who will listen. It’s simple, effective, hardworking and mess free – providing me with the buffing support I need to keep my feet smooth all year round. This summer the foot specialist we all know and love (even if we don’t realise it) are expanding into the hand arena, with the aim of becoming as well known for their manicure expertise as they are for their foot care products. Launching into Boots stores imminently is the new Velvet Smooth Electronic Nail Care System (catchy!) that will have your nails buffed and preened to perfection in seconds. Featuring three interchangable heads, the sleek and simple design is a mile away from the clunky and complex tools of years passed. I remember having one of these about ten years ago and thinking it was the most sophisticated thing ever, but the sheer number of bits and pieces required for a full manicure left me opting for a simple four-way buffer instead. However, the clever people at Scholl have kept it simple and ensure the focus is on the speedy results that can be achieved at the flip of a button. 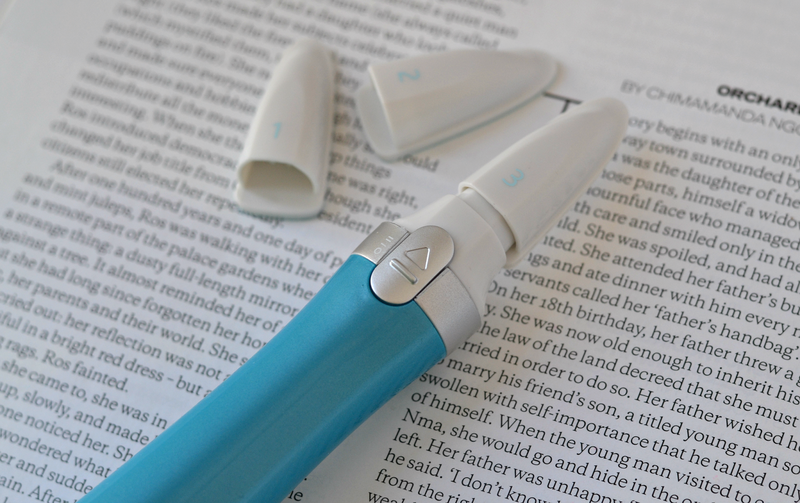 Like their original foot file, the beauty is in the simplicity of the gadget: there’s one button to turn it on and three different heads which can be swapped without effort to create the desired result. 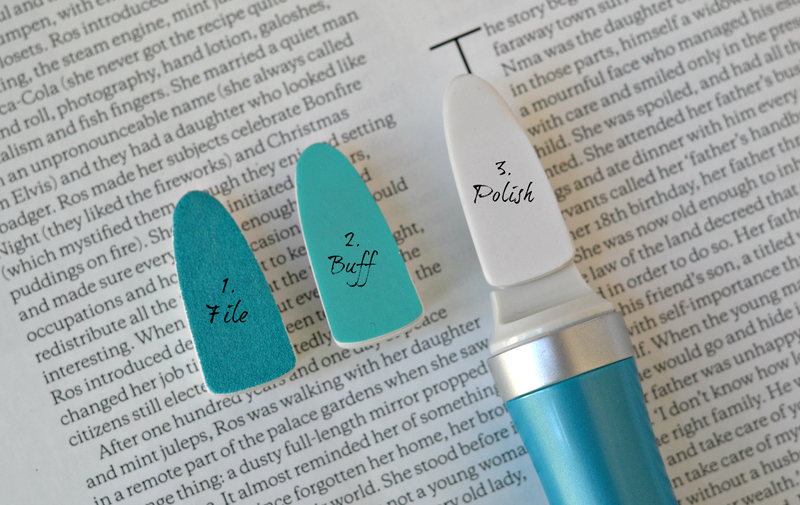 Including a file, buff and polish head, each softly works away to create healthy looking and shiny nails that are good enough to showcase polish free. Initially I was confused as to how the flat nature of the heads would work with a mechanical base (all other models I’ve seen feature rotating spherical shapes,) but the Nail Care System oscillates to ensure as much control as possible. You simply can’t over-buff or file too much off the top of your nail; it’s easy to use and quick to shape nails into the desired result. Although a four-way buffer does the job just as well, this is so much quicker and completely effort-free – so perfect for the lazy girls among us that want to spend as little effort as possible on our talons. My only two gripes are with the lack of ‘container’ or place to store the spare heads (meaning they’re just floating about in my manicure box and are sure to get dirty,) and the price. At £39.99 this really is an investment or a payday treat; if it was half the price I would say run out and nab one today, but at forty quid it’s somewhat of an indulgence. Scholl are *always* on offer though, so it’s definitely worth looking out for in-store promotions and half price discounts… Because you know that’s inevitable! What do you think of these new nail tools from Scholl? Are you convinced about their move into the nail care arena, or do you think they should just stick to what they’re known for? The Velvet Smooth Electronic Nail Care System is available from Boots stores and online, priced £39.99. Replaceable heads are also available, priced £9.99 for a set of three. The Velvet Smooth Nail Care Oil is available now, priced £7.99. it does, it smells amazing! I've been there. I feel your pain. Something like this will really help maintain healthy nails and prevent flaking. Mine are prone to peeling – it helps to remove the dodgy surface that peels, meaning peeling is actually reduced.